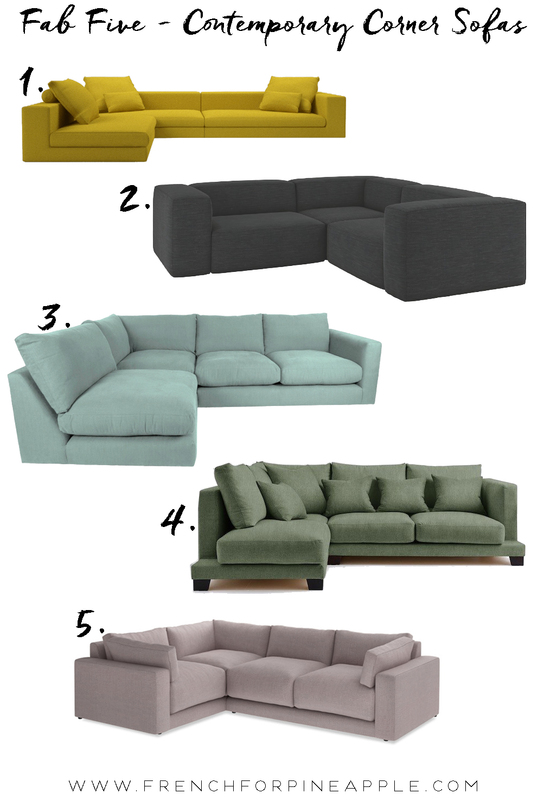 I've been on a mission to find the perfect corner sofa for a new project I'm working on at home. I have officially found THE ONE, and I'm super excited. It's not what I had envisioned, but it was love at first sight when I saw it. And I'll let you know all about that project soon. I had very exacting, non-negotiable criteria - it had to have very specific dimensions - to not only fit the space, but to fill it, and make the most of every single centimetre. It had to be a corner sofa in it's true sense - not a sofa with chaise (though I certainly found loads of lovely ones in that category), and it had to be a sofa bed. Oh, and it had to be under two grand. It also had to be contemporary, casual, and comfortable. Obvs. I know, that's a big ask, and it was hard, very hard, to find one that fulfilled all the criteria. It's lucky that I'm super stubborn, because I knew it was out there somewhere, I just had to find it. And I did. It's been a long time since I seriously looked for a sofa and I must say I was impressed with vast array of fabric options and colours so many places offer these days. It's making my final fabric decision incredibly hard! My sensible side knows I should go quite dark and neutral, because you know, I have two kids and the covers are not loose or washable. I change wall colours nearly as much as my underwear so neutral makes most sense. BUT, my not so sensible side is telling my to go with my heart and choose a more interesting colour. I'm not sure yet which side will win, but I need to decide today! As I said, I'll show you THE ONE soon and tell you all about my plans for that room, but today I'm going to share some other fabulous specimens that I came across on my travels, because it would be a shame not to share these great discoveries. Many of these come in different configurations so don't immediately discount them if you're not in the market for a corner sofa. None of these are sofa beds, so that's primarily why they weren't for me on this occasion. Some were also a tad too big and a tad or more too expensive, but I'll certainly be revisiting them when the time comes to replace our main sofa, once the kids have finished completely trashing it.